83 is here! Blakey and I were picked up by Peace Corps staff at 6:00 a.m., and we trekked down to the airport to welcome the new trainees, give them ulas, and smile at them to theoretically smooth over their culture shock. We stood around with the training staff and a basket of moso’oi and groggily stood around sipping coffee and waiting for the tell-tale sound of jet engines. 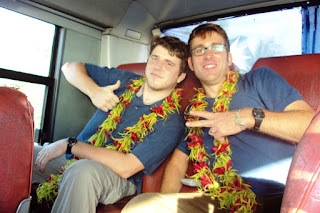 And about a half hour after the plane landed, they started trickling out of the customs checkpoint. This was a slightly new situation for me. The only other time I’ve experienced it was the brief period between when I arrived at the Crown Plaza hotel in Los Angeles for staging and the time our first scheduled session began in the hotel’s conference room: intuitively guessing which random faces in the crowd are Peace Corps trainees. Back in LA, I remember waiting for an elevator next to a short blonde girl, attempting to discern her volunteer-ness through a myriad of indefinable visual cues (Incidentally, the girl at the elevator went to Tonga.). Picking through travelers at the airport this morning was both easier and more difficult. 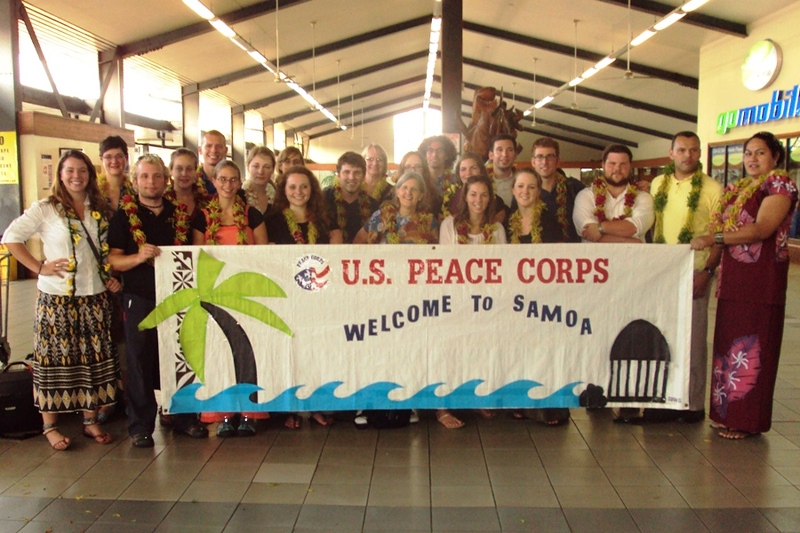 At least half the passengers on the Air New Zealand flight from Los Angeles were Samoans, and since Peace Corps tends to not send volunteers to countries where they have family, they could be ruled out. But I feel like within the remaining group it was difficult to delineate the Peace Corps Trainees from the German tourists from the American travelers from the Kiwi travelers laying over , etc. Does she look like she could grow to enjoy cold showers and bug spray? What would his legs look like covered in mosquito bites? Can I see this person “scraggly”? Could this person wear the same t-shirt for an entire week? It’s seemingly impossible to define criteria to answer these questions, but some people seem to look more the part than others. Some were easier than others. The kid with the curly hair, the girl with the aviator prescription glasses, a couple girls I recognized from their blogs—these were obvious. But a few faces slipped into the crowd and had to be ushered back toward the herd. The first person out was Nancy, who has emailed Blakey and me several times. Blakey and I recognized her immediately. Interim Training Director Jamie turned to me and asked, “Who’s that?” I think not expecting to hear it was a Trainee. I rattled off her last name. Jamie was surprised. 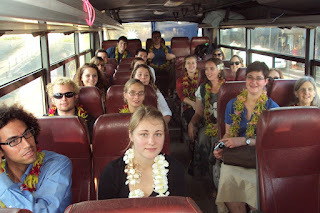 Group 83 on the bus to Apia. Danny and Chris 83. Apparently Danny's mom frequents the blog. Hello, Danny's Mom! Blakey and AJ await the morning's 'Ava Ceremony. Blakey was taupo this morning, and in this photo she is already in costume. Me, Blakey, and AJ at the 'Ava Ceremony. Jenny 83 drinking the 'ava flanked by Rachael and Chelsea 83. Jenny's mom also reads the blog. Hello, Jenny's Mom! A bunch of group 83, as well as a bunch of group 81 and Ally 82, stuck around after the ceremony to finish the 'ava. Thank you also for the photos; it was nice to see that my son made it in one piece. Now, if someone could tell me how to get a care package there without the goodies getting melted or moldy, we'd be all set! I am a friend of Nancy - I assume "the nancy" as it strikes me that she would be the first one off the plane if at all possible. I have enjoyed reading your blog as a way to get a handle on what the PC thing is all about. It's a long way from Florida - of that I am sure. Thanks so much for posting a pic of Jenny (83). This is her mom, Renee, and I am anxiously waiting on her blog posts but she is new at it and has not posted any pics yet so it was great to see yours. Like Danny's mom, I too have read your posts all the way back to the beginning to see what to expect and such and they have been extremely helpful. Thanks again!!! Thanks for the photo and call out on your post, Matt. I owe you a Vailima. Small world that my friend commented on the post.